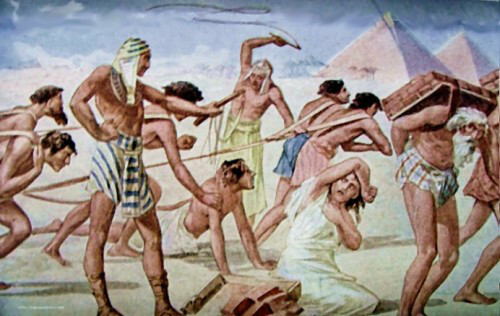 The Holocaust now takes its place in the canon of Jewish legends, like the false legend of Jewish enslavement in ancient Egypt. As with other Jewish legends, truthfulness, or the lack thereof, is less important than the benefits that Jews can derive from the story. Fascinating image. The Egyptian slave drivers are posed exactly as the Nazi SS slave drivers are in Jewish holocaust art. The stories are like exact parallels, except the holocaust fiction goes beyond just expelling the Jews into burning them in fire. I like the picture caption - I'd like to see it added under every piece of holo art.